Fix subtitle view for Arabic and other languages. Fix crash bug on Android 4.4 device. Fix bug when downloading movie on Android 9 device. Add Google Video link providers. Rework Trakt login on Android TV. Add option to hide unaired season, episode. Fix eye icon not sync with Trakt (for movie). Add option to show only RD links. Add tons of RD links. Sort stream links by size. Add option to choose secondary subtitle language. Fix poster on movie detail. Fix subtitle download failed on Amazon Firestick. Optimize layout in movie detail. Improve subtitle view for internal player. Eye icon auto turn yellow for watched movie and tv show. Optimize view on some screens. Add cast with subtitle, support Chromecast. Add sort A-Z on watchlist and collection. Add ability to delete movie in recent. Add FAQ in setting, if you have any question, you can read it. Add some adult movie when you disable safemode in the setting. 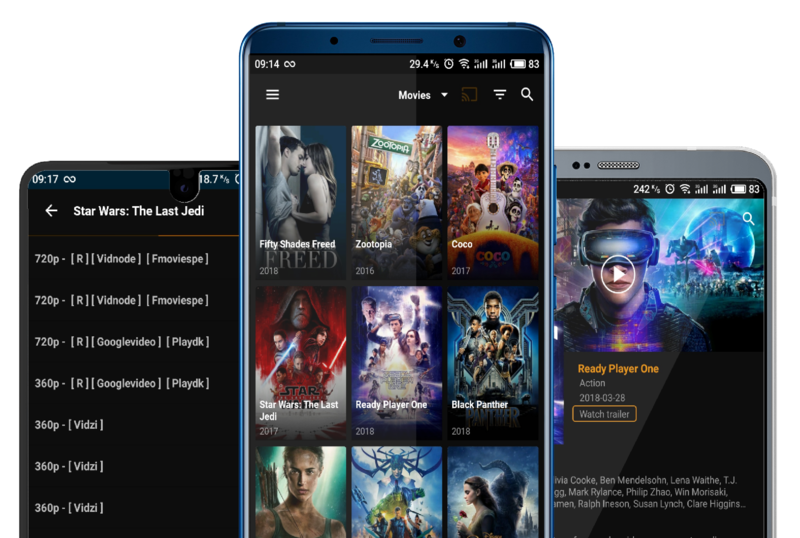 Update HD Releases tab with latest HD movies. Change maximum subtitle size to 31. New: Show grid type in watchlist and collection screen. New: Show movie type in link. New: Add login to opensubtitle account to get better subtitle. Fix: Sync trakt watchlist and collection. New: Add Feature "Sync watchlist from file". If you lost watchlist after update, please use this feature. New: Add more 720 and 1080 Providers. New: LiveTV out of beta with more channels. New: Add Popular TV Show in Discover. New: Add Notification chanel in Menu. New: Add Brazillian Portuguese Subtitles. Fix Bugs When Casting to TV. New: Add more Live TV chanel. New: Custom chanel in Live TV. New: Live TV ( Beta). New: Support Menu button FireTV. New: Support Android Pie 9. New: New UI in Discover. New: Now Playing in Collection. New: Compatible Fire TV remotes. Fix crash on Amazon devices. New: UX Optimization on TV box. New: Show Collections on Discover. New: Optimize for TV Box. New: Add TPlayer support download subtitles online. New: Add More 720p Providers. New: Add tutorial for new users.